Okay. Not really the Canada Revenue Agency (CRA) hence the quotation marks. I strongly suspect most people have received some (several) scam calls. The scam might differ but the end game is the same. I share my recent experiences because I want to warn as many people as possible not to fall for these con artists’ attempts to part you from your money. If you are like me you are most likely to just ignore the unsolicited calls. There are a great number of victims, however, who respond to these calls and who have lost money. A lot of money! If you can’t imagine how there is anyone so gullible as to fall for these scams then ask yourself why these con artists would not move on to something more lucrative. I have spoken with a few individuals who have told me their parents and grandparents lost money to such scams. 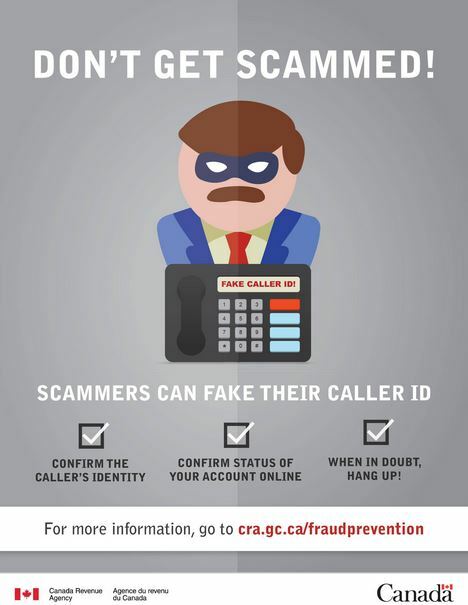 Some involved scammers purporting to be from the CRA and another scam involved a loved one having recently been arrested and release of this loved one could be achieved if a ‘fine’ was paid immediately. I also personally interfered on another type of scam wherein my in-laws were contacted in the wee hours of the morning by some fraud prevention department which was in the active process of trying to prevent fraudulent activity on my in-law’s credit card; the agent from this fraud prevention department actually wanted my in-laws to divulge their credit card number and the 3 digit code on the reverse of the card. A couple of weeks ago I received a recorded message on my cell phone’s voice mail. The call was purportedly from the Canada Revenue Agency. Now that I am retired, I have a bit more time to do things I would not have done when work was interfering with the better part of my life. As a result, when I received a call purportedly being made from the 613 area code in Canada (that is what appeared on my cell phone), I listened to the recorded message; I suspect the con artists think that if call display reflects a phone number with an area code for Canada’s capital there will be some air of legitimacy. Who knows how these bozos think. I called the number reflected on my call display. The male ‘agent’ who answered asked me for my name and address so they could look up my file. I provided a fictitious name and address and the ‘CRA” agent asked me to hold for a minute while they looked up my file. I waited a few seconds and sure enough this agent had ‘found my file’. He then provided me with his name (Constable ‘whatever’ and badge ‘whatever’) and indicated that I had been contacted because I had committed various tax related offences. I was asked whether I produce my own tax returns and whether I have a lawyer who would be able to represent me. I indicated I prepare my own tax returns and I do have a lawyer who could represent me. The agent informed me that he would read the charges being brought against me and that I should not interrupt him. He proceeded to rattle off four charges. I can’t remember what they were because I had just completed a 2 hour cross-fit program earlier that day morning and was now at home nursing a cold ‘wobbly pop’ (hey, it was the afternoon of a REALLY hot day) without having yet consumed any food; the beer had gone straight to my head and my attention span was short(er than usual). After reading the charges the agent informed me that if I was prepared to admit my guilt and to settle the matter immediately my penalty would only be ~$2,900. If I decided to contest the charges I faced a ~$97,000 penalty. Well! Now that set me off. My voice trembled and I started to get heart palpitations. I informed the agent that my family often had more month than money. I was taking cash advances from one credit card to make minimum payments on other credit cards, our family car was about to be repossessed, and I was secretly bringing household effects to the pawn shop in order to raise money so we could make it to the end of the month. Okay, not really, but these con artists prey on people in this predicament. No ethics. No morals. No sense of decency. Finally, the ‘stress’ just got to me and I snapped. I told the agent to perform some sexual act I think is impossible to perform. I am not speaking from experience. I just have this visual of someone attempting to perform what I suggested and seeing that person having to go to a chiropractor. Now imagine…the ‘agent’ hung up on me. The nerve of him! I’ll be damned if someone is going to reach out to me looking for money only to end up hanging up the phone. What did I do? I called the number again. I tried several times and repeatedly got a busy signal. Hey, I really, really didn’t want any trouble with the CRA. I was ‘eager’ to resolve the issue. Finally, I got through and asked to speak with the ‘agent’ with whom I had had an earlier conversation. When he came to the phone he indicated I was in serious trouble and that members of the RCMP were on their way to my house to arrest me; I suspect the ‘agent’ doesn’t even know what this acronym means. I thanked him but questioned how that would be possible since I did not provide my real address. He hung up on me again! Are you kidding me? Fast forward to yesterday and another phone call from the 613 area code! Here we go again. The CRA tells me I am in trouble. If only I had been able to send them ~$2,900 a couple of weeks ago I would have been able to put an end to these calls. This time I was not nursing a ‘cold beverage’ when I made my phone call. The same process occurred as a couple of weeks ago but this time I decided to use the address of a RCMP constabulary in addition to a fabricated phone number. I told you….when you’re retired you can find the time to do this kind of stuff so I stayed on the phone much longer than two weeks ago. I once again pleaded with the ‘agent’ that this was all a mistake and that I wanted to put this matter to rest. This time, the agent offered to get in touch with the RCMP to tell them to hold off on coming out to get me. I was asked to provide the phone number for the local RCMP constabulary. You think I’m joking? Nope. These guys are stupid. Really stupid! The agent asked me to hold but purposely did not put me on mute. He then ‘proceeded to call’ the phone number I had provided so I could hear his ‘conversation’ with the RCMP officer. Thankfully this ‘agent’ has a great relationship with the RCMP and the RCMP agreed to hold off on sending an officer to arrest me. Heaven forbid! Where would I be now if that ‘agent’ had not had such a great relationship with the RCMP. By now, I was getting tired of the call. I had an article to write for my blog which I really needed to get done that day. Now remember, I had not had any wobbly pop. I still, however, lost my patience. I proceeded to tell the agent that he was a cavity in the human body one can’t see when facing the mirror. I also said other stuff not worth sharing. OMG! The ‘agent’ hung up on me. I was peeved so I called back. This time a female agent answered the phone. Same process except this time I didn’t let the call drag on and I was far more polite (but not 100% polite). I asked what would posses her to scam innocent people. Damn! Even that agent hung up on me. This time a different female ‘agent’. The same thing happened. She hung up on me too. All this rejection! I’m starting to get a feeling these ‘agents’ don’t want to talk to me. This time, the first agent with whom I had had a conversation came on the line and rattled off the fabricated names I had previously provided. I told him I know these calls are a scam and could he just speak with me for a moment as I just wanted to know what would possess people to do what they are doing. He confessed it is a scam and he agreed to speak with me. Quite frankly, our phone call was civil. I asked what part of the world he was calling from. It sounded as if he was from India, Bangladesh, or Pakistan. I was close. He was calling from Sri Lanka. I told him that we had sponsored a couple of children at a School for the Blind for several years back in the early 1990s…back in the day when the Tamil Tigers were ‘active’. I don’t think this ‘agent’ had even been born during the time we were sponsoring these foster children! Before proceeding any further I asked if he could let me speak with the two female agents so I could apologize for some of the things I said to them; the things I said weren’t terrible but they weren’t nice either. After apologizing to them the male ‘agent’ came back on the phone and said I made had just made their day. I can’t imagine I am the only person who says less than pleasant things to these ‘agents’. Unless these ‘agents’ are truly unethical I can’t imagine how they can go home and look at themselves in the mirror and not feel bad. I suspect these female ‘agents’ do have a shred of decency and will give up what they are doing in the not too distant future. As for the male ‘agent’…I think he is a lost cause. When I asked him whether he intended to continue to do this as he got on in years he indicated he intended to do this ‘job’ for as long as possible….even when he was in his 50s and 60s. He proceeded to tell me that he makes $10,000/day and only works 4/days/week to which I replied all the more reason he should feel ashamed. I also suggested he do the math to see how outrageous his claim is. At $10,000/day x 4 days/week x 48 weeks/year (he needs 4 weeks of vacation because this ‘job’ is so stressful) and you get $1.92 million/year. Some turn to scamming other people. Some turn to drugs and alcohol. I indicated that if he was making that much money he should have made enough money in one year to provide a decent quality of life given the cost of living in Sri Lanka. He indicated not all of that money was his to keep as there are several more senior people in the ‘company’ who must be paid first. I asked him why, out of curiosity, the call appeared to come from a phone number in the 613 area code. He indicated that they can make it appear that the call is coming from anywhere…even 911! The more I spoke with him the more I realized that this individual had no remorse whatsoever. He indicated that if people were prepared to send him money then that wasn’t his problem. The reason he was doing this job is because there was no other job which would pay him remotely close to what he was making for the same level of ‘work’. When he indicated he would like to move to Canada I suggested he stay in Sri Lanka. We already have more than our fair share of unethical and immoral people in this country. We certainly don’t need the likes of him. After speaking with him for several minutes I thanked him for his time and hoped that what I had mentioned on the call would eventually sink in. I strongly suspect it won’t but if he follows through with his assurance that I would be removed from his ‘call centre’s’ list of potential victims then I will consider my time spent with him worthwhile. I am not naive to think there is only one scam call centre in this world so I fully expect to continue to receive more scam calls. I only did what I did to experience the 'process' so I could warn others. Going forward I will just ignore these calls and I suggest you do the same. On a final note, please share this post with others as a warning that scam artists throughout this world are trying to separate you from your money. Don’t become a victim.